Does Shaving Your Baby's Head Make The Hair Grow Back Thicker? Popular wisdom has it that shaving your baby's hair promotes hair growth. Is there any truth behind this common belief? Across many Asian cultures, it's a common belief passed from mum to mum: shaving your baby's hair will make it grow longer and thicker. Many mums swear by the importance of shaving to make way for healthier, silkier tresses. My own mum has often regaled me with tales of how ugly my newborn hair was (complete with photo evidence). At a few months old, what little fuzz I had was thin and patchy until she took me to the hairdresser's. So is this cultural practice backed up by science? The bald answer: no. The texture of your baby's hair is genetically predetermined from birth, according to Leonica Kei, director and senior trichologist at Singapore's Philip Kingsley Trichological Centre. Babies are born already possessing all the hair follicles they will ever have. Simply put, hair follicles are pockets of cells beneath the scalp surface which produce hair. The size of the follicles determines the thickness of your baby's hair — the bigger the follicle, the thicker the hair strand. The number of follicles, on the other hand, determines how much hair your child will have. The higher the number of follicles, the more hairs possible to be formed. Shaving, of course, doesn't change the hair follicles rooted in your bub's scalp. This mean it's your genes, not shaving, that can take credit for your child's gorgeous tresses later on. In fact, experts advise that parents might want to delay shaving their babies' heads, for fear of injury. "A baby's scalp is very tender," Kei says. "The top of his head, called the fontanelle, is especially soft because his skull bones have not fully knitted together." 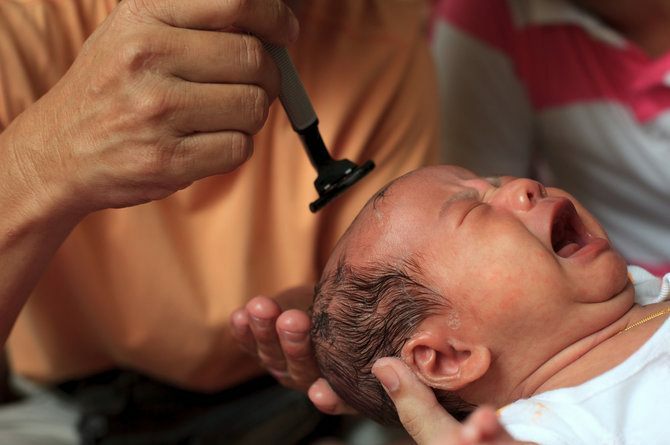 There are good reasons why your newborn's hair doesn't quite look its best. Babies start off with vellus hair, explains Kei, which is "short, fine and poorly pigmented". By the time your tot reaches two, this early hair will have been replaced by lush, mature terminal hair. Another common worry that mums have is uneven or patchy hair. 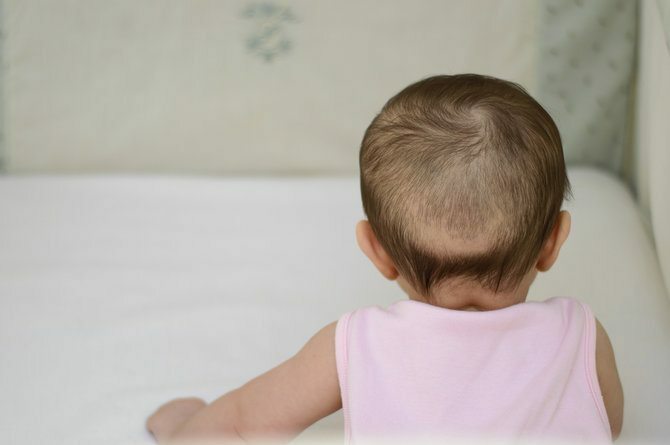 Infant hair loss may be the culprit in this case, and it's a natural part of baby development, according to LIVESTRONG. This balding may happen due to hormonal changes and can last up to 6 months. If your baby's balding is occurring in spots, this may also be caused by sleeping and sitting positions. According to experts, babies who rub the back of their head against a baby seat or mattress often lose hair in that spot. To reduce hair loss from too much time spent in the same position, you are advised to give the little ones more tummy time. Alternatively, you can switch up which end of the cot you lay your baby's head during sleeptime. Though you should consult a doctor if you're concerned about your baby's hair growth, there's usually no need for you to do much but let nature run its course. Meanwhile, enjoy your little one's adorable hairdo, tufts, thin hair and all!